For Roku’s first foray into original content, they went looking for a creative partner with deep capabilities across content development, graphic design, and physical production. Ostrick Productions worked with Radley Studios and served as the show-runner to bring this interactive TV series come to life. Roku Recommends curates the latest, greatest, and timeliest content from the wealth of options served up by the market leader in streaming entertainment. One reason for ROKU’s success (they’re the most popular OTT streaming provider) is a great user experience and a friendly, approachable brand that makes potentially intimidating technology palatable for everyone. ROKU Recommends was designed to extend that user experience, and give a human face to the ROKU brand, while highlighting just some of 2000+ channels and thousands of hours of content available to them. 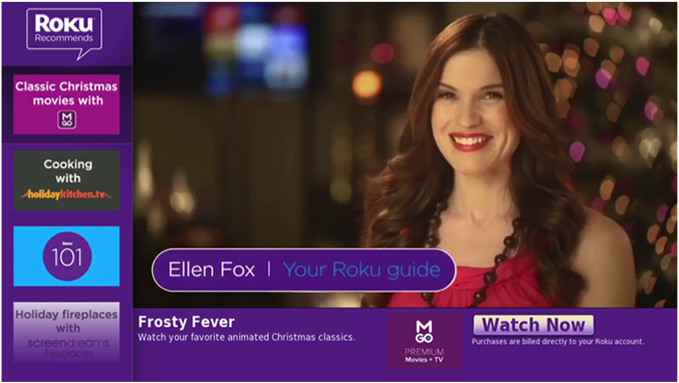 Together, Ostrick Productions and Radley Studios crafted a a hosted, interactive format that that extended the ROKU user experience and gave a human face to the ROKU brand, in host Ellen Fox, while providing high-value recommendations for the audience and a platform top deliver value for channel partners and sponsors. Posted on Tuesday, June 30th, 2015 at 11:59 pm. Filed under: Selected Works	RSS 2.0 feed.